The authors are with Queen’s University of Belfast, Department of Pure & Applied Physics, Belfast BT7 1NN, Northern Ireland, U.K. 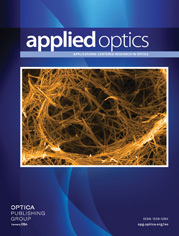 The optical properties of thirty-five all-dielectric spectral filter coatings for the visible spectrum have been investigated and correlated with the deposition conditions of the constituent layers of cryolite and zinc sulfide and with the processes which occur when the coatings are exposed to atmosphere. It will be shown that the results of measurements of transmittance and reflectance over the passband wavelengths can be predicted theoretically only if account is taken of absorption in the layers and scattering at the rough boundaries and of changes in the refractive indices of the layers due to water penetration. A change from 0 to 1 or vice versa in H or V represents a π rotation of the specimen holder about the horizontal or vertical axis, respectively. a The errors quoted in these columns are standard deviations. All other errors in this table are errors in the mean. M, manual control, υ, measured in vacuo.